Julia is one of Harvard’s most distinguished sailors, and a former captain of the women’s team. She was a three-time ICYRA Outstanding Woman Sailor (the equivalent of today’s Women’s All-American selection) and was twice chosen by her peers as New England Women’s Intercollegiate Sailing Association Outstanding Sailor. Her sailing accomplishments include winning the New England Women’s Single-Handed Championships twice. 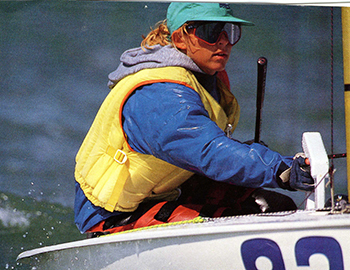 In 1992 Julia went on to win the U.S. Women’s Single-Handed Championships which secured her a berth in the 1992 Olympics in Barcelona, Spain. In the Olympics she won the Bronze medal in the Europe dinghy class. In 1993, she was named the Rolex/U.S. Yachtswoman of the Year, one of the biggest awards in U.S. Sailing. Great credit goes to my family. Thankfully, I heeded most of their advice. Like everyone up on this podium, I have had tremendous support from them, and I mean extended family when I say family. My grandparents taught me how to sail and exposed me to the sport at an early age, which is a great gift. From there, my parents took up the challenge of teaching and encouraging me, and believe me, sailing is not one of those sports that comes easily. It involves a lot of travel, a lot of lugging of equipment and a lot of practice time. A pair of sneakers and a tennis racquet is easy─try carrying a 12-foot boat on top of your car to the west coast and back. My Dad was always there for me, and Mom tirelessly ran our junior sailing program during my youth─surely so that she could subtly influence the instructor roster and make sure we had the best opportunities available. She continues to this day to make extensive volunteer contributions to the U.S. Sailing Association. With incredible accomplishments himself, my brother also spurred me on in the sport of sailing. And finally, my husband Jim, who was on the 1992 U.S. Olympic Sailing Team, coached me while winning a silver medal himself during the Barcelona Olympic Games. Without each of these family members, I wouldn’t be where I am today. As I reflect on this incredible honor of being inducted into the 2004 Harvard Hall of Fame, I realize how much effort it took on so many people’s part outside my family as well. My Harvard coaches─Mike Horn, a Harvard Hall of Famer himself, and Ben Caesar, as well as my teammates and my loyal crew, Mary Lohnes Ehrenworth─all made my Harvard sailing experience incredibly valuable. After having practiced hard all week, we spent every weekend in the fall and spring competing at regattas. Because of the opportunity Harvard afforded me, I concentrated intently on sailing during this time period. It was a steep learning curve that launched me to the Olympic level. Without Harvard, I might not have had the opportunity to go to the Olympics and stand on that podium. One of the unique and special aspects about the sport of sailing is that it is a fairly small, tight-knit, supportive community. After having competed in a number of international events, from Brazil to Sweden to Italy, I now have friends in many countries around the world who I visit. It is a wonderful expansion of my horizons. As I peruse the list of distinguished athletes whose company I am in tonight, I marvel at the fact that I am up here with them. Many of them were my idols, as they accomplished so much and did so with so much grace. I thank all of you for your support, encouragement and recognition, and only hope I can serve as a role model for others coming along after us.